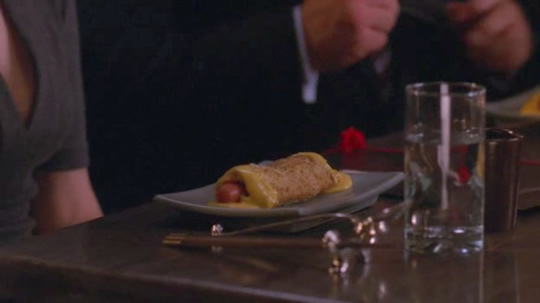 Season four of 30 Rock started with a nod to extreme food with a visit to Season Four, the #1 Asian fusion restaurant in New York City, to touch base with the heartland by eating Cheesy Blasters, the "#1 selling food in the rest of America." Liz Lemon sings the theme song: "You take a hot dog, stuff it with some jack cheese, fold it in a pizza... You got Cheesy Blasters." Apparently it's eaten with chopsticks. Says Tracy Jordan, "I can't eat this, I'm a foodie." Is it weird that it sounds good? Not at all! I want to make those at home tonight for a midnight munchie!! YUM!